It gives me great pleasure to be in your midst on the occasion of the 60th National Film Awards Function. At the outset, let me congratulate this year’s Dada Saheb Phalke Award Winner, Shri Pran. I hear that he is indisposed but I am sure he will recover well and fast. I wish him a long and healthy life. 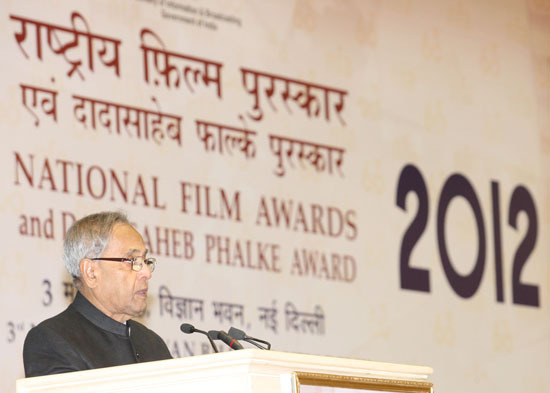 My congratulations also to the National Film Award winners. Today, the Indian cinema is one hundred years old. It was on this day that the first silent feature length movie, ‘Raja Harishchandra’ by Dada Saheb Phalke was released. When the technology of cinema reached the shores of India in the early 20th century, the Indian community welcomed and adopted it wholeheartedly. This medium was effectively used to strengthen the tradition of story-telling in our country. Later, as years went by, cinema evolved into a powerful medium encompassing all regions and languages of India and thus reflecting the socio-political aspirations of our people. The film industry has adapted to technological changes, transforming from a silent black and white format to advanced digital form. In fact, Indian cinema has now become a global enterprise. It has upgraded itself, as also radically altered the manner in which it reaches the audience. I am proud that Indian cinema today has found a market in a large number of countries. Increasingly, our film makers are being recognised and given a place of acclaim in the international film festivals. This is a great example of how India’s soft power can help project the nation around the world. We have a rich and varied cultural heritage that has been, and continues to be, a very significant base for telling the world the story of India - a nation whose history goes back many millennia, a nation that occupies an important place in the contemporary world and a nation whose future holds great promise. I understand that a record-breaking number of entries were received in all the categories for the year 2012 – be it feature, the non-feature section or on the best writing on cinema. This trend is encouraging. I hope the number of entries in coming years shall continue to increase. This is one occasion which is awaited every year by the Indian film industry, for it is the time when the deserving are honoured for their creative and aesthetic excellence. It is also an occasion when new and upcoming talents get recognition. The number of awards being given this year is reflective of the fact that Indian cinema has greatly improved in terms of quality. It is also heartening to learn that after many years a film made in Mising language – a language that is spoken by a small group of people of Assam has won an award. Cinema is a powerful medium for conveying a message. The language of Cinema, in many ways, transcends regions and boundaries. The number of people who watch and are influenced by films is very large in our country. The recent incidents of crime and against women and children have shaken the conscience of the nation. We must find ways to reverse the erosion of our values. In this context, I would like to stress upon the crucial role the Cinema can and must play in resetting the moral compass of the nation. It is the responsibility of everyone associated with the film industry to use the powerful medium of cinema to portray our positive societal values for building a tolerant and harmonious India. I call upon the entertainment industry to be mindful and sensitive to this responsibility and take all steps to provide cinema that is morally energising. I am glad to learn that Ministry of Information and Broadcasting is taking several measures for promoting Indian Cinema such as nurturing and encouraging production of quality and meaningful films, showcasing them as well as preserving our filmic heritage. I also learn that to promote film shooting in the country, Ministry of Information & Broadcasting is setting up an Inter-Ministerial Committee for Promotion and Facilitation of Film Production in India which would function as a single window of various agencies of the Government in giving clearances for film shooting in the country. I am sure this will go a long way in strengthening our film industry. In this fast paced environment, the technique and aesthetics of cinema is also changing. But even in the midst of this change, there are talents that leave a lasting footprint. Their works carry an essence of timelessness and are appreciated across generations. One such person is this year’s winner of the Dada Saheb Phalke Award, Shri Pran. He started his film career as a hero but later took on roles of the quintessential gentleman villain. In the sheer variety of roles that he did, he excelled in each one of them. We remember Shri Pran not only for this consummate artistry but also for what he is in real life – a fine human being. I would like to convey my compliments to all Members of the Jury for the untiring effort they put in assessing the entries that came to them. I take this opportunity to once again congratulate each one of the award winners and wish them continued success in their pursuit of excellence. I am confident that their creativity will touch new heights in the years ahead and that they will continue to provide good as well as value based entertainment.